Iâ€™m updating all my units pack in order solve the issue with the uniforms , Iâ€™ve also added new custom helmets and ported A2 uniform . Vehicles are now optional, in order to activate them just put the optional config in your addons folder, as described in the install instructions below. Iâ€™ve also reworked almost all the camos to fit better and added SD ammo for stealth missions and new bonus units, like SWAT, HRT, NBC, CPU, delta â€˜90 wich includes some teaser for loadout combination and maybe future addons. There are also some small other fixies youâ€™ll find in the changelog. - AOR2: for temperate and wooden areas. - AOR1: for arid and desert environments. - MULTICAM: operators in BIS multicam camo for every kind of environment from desert to temperate and wooden areas. - Direct Action: grey coverall suite for CQB and naval operations. - Ghost: operators in ghost camo for every kind of environment from desert to temperate and wooden areas. - Field Ops: civilian clothes\guerrilla style operators for undercover missions. 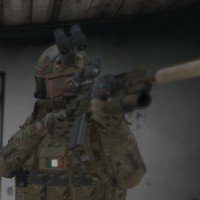 - SF: operators in woodland camo and multicam gear. - Woodland: for temperate and wooden areas. - Desert: for arid and desert environments. - MULTICAM: operators in multicam camo for every kind of environment from desert to temperate and wooden areas with multicam equipment. - MULTICAM\GREEN: operators in multicam camo for every kind of environment from desert to temperate and wooden areas with Ranger Green equipment. - Direct Action: multicam and black gear for CQB and DA operations. - Ranger\DEVGRU(arctic): for snow and arctic environments. - USSOCOM(Vehicles): A3 vehicles adapted with USSOCOM gear and crew: Quad, MRAPs, APC, Boat, Speedboat, SDV, Mortar. - USSOCOM(Support): Ammo bearers units, pilot and crew. - DEVGRU(Para): DEVGRU units equipped with parachutes ready to be deployed fom the sky. - RANGER(Para): RANGER units equipped with parachutes ready to be deployed fom the sky. - USSOCOM(Divers): USSOCOM divers units ready to be deployed fom the sea. - USSOCOM(Snipers): USSOCOM snipers and spotters in ghillie suite multicam, desert, woodland and arctic. I used what I found on web as reference sources. - Units are equipped with M4A1, HK416, SCARs, M249, Mk48, SR25, HK417, M107, Launchers , USP and ACP from my NATO SF\Spetsnaz weapons pack. - Units are equipped with custom helmets, headgear, NVGs and uniforms. - Heavy gear assault units for all the camos. - Recon units for all the camos in 2 version "heavy" (Helmets and NVGs) and "light" (soft headgear). - Ghillie suite snipers and spotter units for all the camos. - Retextured A3 vehicles: Quad, MRAPs, APC, Boat, Speedboat, SDV, Static weapons, offroads, choppers wich have custom crews and gear loadout. - Vehicles from my vehicle pack : HMMVWs, CH47, UH60, Static weapons with firing from vehicles, sling load and advanced flight model features. - Units have their own uniforms and gear items in all camo to make them interchangeable. - Divers have their backpack with uniform, chest rig and helmet inside already to make them change clothes once ashore, plus their normal stuff (NOT WORKING ATM). - There are 2 weapon boxes one contain all weapons ammo and items, the other contains all the uniforms, gears, and helmet stuff, you can place them in missions to quick configure your loadout. I made this optional config on users demand since by default vehicles are now disabled and NATO SF\Spetsnaz Vehicles pack is not a requirement. In order to get the vehicle just put the "mas_usa_devg_v.pbo" plus its signature files in the "addons" folder, if you do so you'll need NATO SF\Spetsnaz Vehicles pack. Youâ€™ll find all classnames in the classname file included in the folder. No problems found so far. Johannes: most part of the headgears has been taken, modified and adapted from Jonny's US Army Special Forces template by Johannes , thanks a lot for releasing them to the pubblic, without them I wouldn't have been able to add this headgear to the units ! Kiory: thank you very much for letting me use and modify your great balaclavas and berets models for the units! Voodoo: thanks a lot for your awesome OPS CORE helmets, Peltors and watchcap, that made possible to update MICH hemets too! Thanks a lot to BI for their great Arma 3! Thanks to all Arma community for great support ! Hope you'll enjoy these units! Finally! Huzzah! You just made my day, massi! i have noticed that when silencers are equipped you cannot go to burst or full auto.. is this intended? will you be using any different sounds or stick with the vanilla sounds for the time being? I'm not a huge fan of the SDAR, as I don't run missions where you fight underwater. It would be cool if you had Diver units with suppressed MP5s instead of SDARs (Navy SEAL style), especially considering that only the officers start with the iconic MP5. ive also noticed the helmet on the divers that cannot be equipped due to the wet suit. the MP5 does not look right with the flashlight and the sight is out compared to the original sight. getting a lot of missing textures for the rangers and seals. Will post the error code later. Over all great work. strange, since I tested the packs alone and with other addons and I didn't get any missing textures, please report wich textures are missing anch check if you installed right both "mas_usa_devgr.pbo" and "mas_usa_devgr_c.pbo" files, since they're both needed , I'll check also the 40mm on the grenadiers! the blufors pistol doesnt seem textured or is that unfinnished? I agree, the Multicam is WAY to light to blend in with anything. Anyway, nice work! I love it and hope to see what you come up with in the future. Hi, I noticed that since last updates the uniform and vest in backpacks (through config) are not showing up anymore...anyone know the fix for that ? would you have any idea how to fix this? i tripple checked and made sure everything was vanilla and it still cannot be played without me having this addon enabled? i have copied the mission in the editor and re-opened editor and pasted and now the vanilla version works. so the problem lies in the mission file when i saved the mission with your units. it must have left trace of something or changed a config file. i have replaced the whole mission in the editor now, what would i do if this occurred again? and it did say something in the file?